Steve, thanks for your time! What is your current position/Channel/Shift? Do you have anything you’d like to talk about? Such as stories from TV News? The crazy thing about my job, is that I really don't know what I'm covering until I walk in the door... and even then, it could change 3 times. Stories that involve children being hurt are, without question, the toughest to cover. As a dad of 3, I can't help but get emotionally invested. Fires are also tough... watching homes burn... knowing lives are being changed forever. But there are many good days too. I love reporting on people who go out of their way to help fellow San Diegans! We moved here from Baltimore after a blizzard so, without question, our favorite place to visit is the beach! We love Law Street in PB. It's sort of like our Cheers Bar... we can't go there without running into friends. My career definitely got off to an exciting start. My first every story in Palm Springs in 1989 was a huge marijuana farm drug bust. We had to drive up this long dirt road and I bottomed out the car. Let's just say my first impression with the station's owner was not a good one! Here in San Diego, my first story was about a trolley expansion and we had some technical difficulties so the tape wasn't ready. I was super nervous and had to stretch for about 30 seconds, but it felt like forever! Honestly, my job is still exciting every day because I never know what to expect when I walk in to the newsroom. I'm all over the place here... Thai food is a favorite, but I'll never turn down Poke or an In-N-Out burger! My family and I LOVE to travel. Recent trips include Thailand, Peru, the Amazon, Costa Rica and South Africa with stops in Zambia and Zimbabwe. Next up is Germany, Poland and Prague! How do you view TV News now, compared to the past, then looking to the future? News has definitely changed a lot since I first started in 1989! Cable news wasn't very popular and there was no such thing as the internet. Now people can get news instantly... so there's a lot more pressure to get information out quicker... but at the same time, it's also important to take the time to get it right. I think there will always be a need for local news, but I think we'll be reporting for smartphones more than people watching TV on their couch. I was an extra in Forrest Gump, so I'm kinda partial to that! It's the scene where Forrest Gump walks onto the bus and meets Bubba. I was outside the bus and since it's raining, you can't actually see me, but trust me, it was an Oscar winning performance! Twitter is great because you can instantly connect with viewers. During the Bernardo Fire in 2014, viewers evacuated from the area tweeted my their address... then I went by their homes and tweeted back pictures so they could see that everything was ok. Luckily, none of the homes I was asked to check out burned to the ground... but at one house, the fire got so close, their miniblinds inside the window melted. They thought their home was a gonner - so they really appreciated that picture! What is your favorite TV News moment, involving yourself? In San Diego, it was during the Bernardo fire. We saw a fence on fire and it was burning toward the home. We were about to go live, but we knew if we didn't put out the fire, the house would most likely burn... so we grabbed the garden hose and as I was spraying the fence, the producers took out live shot. It ended up going viral and I had friends and family all over the country calling me. Is there anything in particular you like about the San Diego market vs other markets you’ve worked in? No blizzards here! I hated standing outside in the freezing cold - to tell everyone to stay inside! Also, the crews here at other stations are competitive, but they're also respectful and friendly. This one is definitely the most interesting! I grew up watching Michael Tuck... and always admired his professionalism. 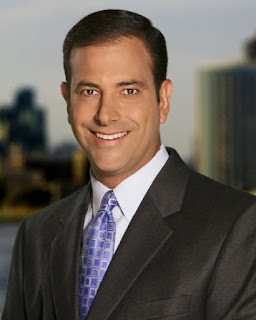 Getting to work with him for a few years at News 8 was awesome. He was a total pro who really cared about each and every newscast and making everyone around him better. I also admire every war corespondent. Putting your life on the line EVERY day in an unfamiliar environment is stressful and difficult, but their work is extremely important. If you could go back in time and work during any era of TV News for a few days - which would you choose? There have been so many amazing moments in history that I would love to cover... but I don't think there is an era I would trade for the one we're in now. This is a great news market. San Diegans are very informed and appreciate solid journalism. Viewers are friendly, but will also call you out when you make a mistake. (Some do it nicer than others .) I feel very fortunate to work and live here.